Eight years ago this month, the stock market free fall came to an abrupt end. 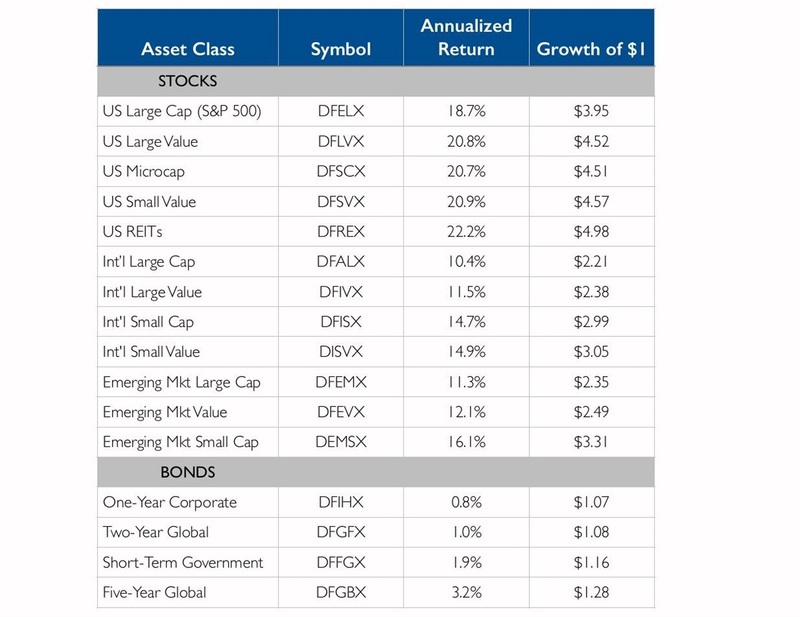 Looking at the returns on major global stock asset classes since March of 2009 reminds us about the importance of having a diversified investment plan and staying with it, even during the darkest of times. The reward that disciplined investors have earned on stocks relative to low-risk bonds over the last eight years is a helpful reminder of why you should stick around in a tough market. If you would like a second opinion about your own investment plan or have realized you have a difficult time designing and sticking with an appropriate portfolio for your personal circumstances, feel free to touch base. We are happy to discuss your finances with you further. Past performance is not a guarantee of future results. Mutual fund returns include the reinvestment of dividends but not additional advisory fees that might be associated with investing. This article is distributed for informational purposes and is for not to be construed as an offer, solicitation, recommendation, or endorsement of any particular security, products, or services.